In July we initiated a process for readers to participate in evaluating the extent to which actual decisions made at nuclear plants were consistent with a strong safety culture. (The decision scoring framework is discussed here and the results for the first decision are discussed here.) Example decision 2 involved a temporary repair to a Service Water System piping elbow. Performance of a permanent code repair was postponed until the next cold shutdown or refuel outage. As with the first decision, most of the scores did coalesce in a limited range for each scoring dimension. Based on the anchored scales, this meant most people thought the safety impact was fairly significant, likely due to the extended time period of the temporary repair which could extend to the next refuel outage. The people that scored safety significance in this range also scored the decision strength as one that reasonably balanced safety and other operational priorities. Our interpretation here is that people viewed the temporary repair as a reasonable interim measure, sufficient to maintain an adequate safety margin. 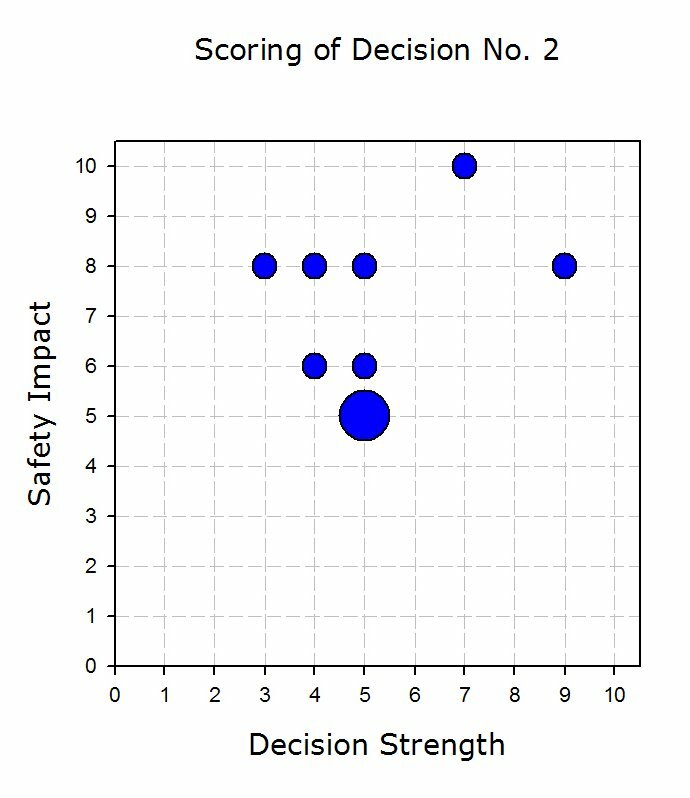 Notwithstanding that most scores were in the mid range, there were also decision strength scores as low as 3 (safety had lower priority than desired) and as high as 9 (safety had high priority where competing priorities were significant). 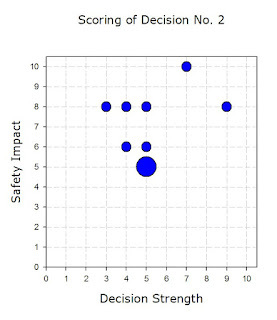 Across this range of decision strength scores, the scores for safety impact were consistent at 8. This clearly illustrates the potential for varying perceptions of whether a decision is consistent with a strong safety culture. The reasons for the variation could be based on how people felt about the efficacy of the temp repair or simply different standards or expectations for how aggressively one should address the leakage problem. It is not very difficult to see how this scoring variability could translate into similarly mixed safety culture survey results. But unlike survey questions which tend to be fairly general and abstract, the decision scoring results provide a definitive focus for assessing the “why” of safety culture perceptions. Training and self assessment activities could benefit from these data as well. Perhaps most intriguing is the question of what level of decision strength is expected in an organization with a “strong” safety culture. Is it 5 (reasonably balances…) or is something higher, in the 6 to 7 range, expected? We note that the average decision strength for example 2 was about 5.2. Stay tuned for more on decision scoring. You Want Safety Culture? Then Pass a Law. On October 7, 2011 California governor Brown signed SB 705 authored by state senator Mark Leno. The Leno bill, among many others, was inspired by a major gas pipeline explosion that occurred September 9, 2010 in San Bruno, CA resulting in multiple fatalities. The ensuing investigations have identified a familiar litany of contributing causes: defective welds, ineffective maintenance practices, missing and incomplete records, and lax corporate management. I was surprised that an unambiguous statement about safety’s importance was apparently missing from the state’s code. I give senator Leno full credit for this vital contribution. Now this comment is typical political braggadocio, and the culture will not change “immediately.” However, this law will make safety more prominent on the corporate radar and eventually there should be responsive changes in policies, practices, procedures and behaviors. ** W. Buchanan, “Governor signs bill forcing automatic pipe valves,” S.F. Chronicle (Oct. 8, 2011).